Zion Market Research has published a new report titled “Micro-Display Market by Product (Projection and Near-To-Eye Displays (NEDs)), by Display Technology (Liquid Crystal On-Silicon (LCoS), Liquid Crystal Displays (LCD), Digital Micro-Mirror Devices (DMD), Digital Light Processing (DLP), Organic Light Emitting Diode (OLED), and Others), by Application (Head Mounted Display (HMD), Head-Up Display (HUD), Electronic View Finder (EVF), and Projector), and by Vertical (Automotive, Aerospace and Defense, Retail, Healthcare, Entertainment, and Others): Global Industry Perspective, Comprehensive Analysis, and Forecast, 2018–2025’’. 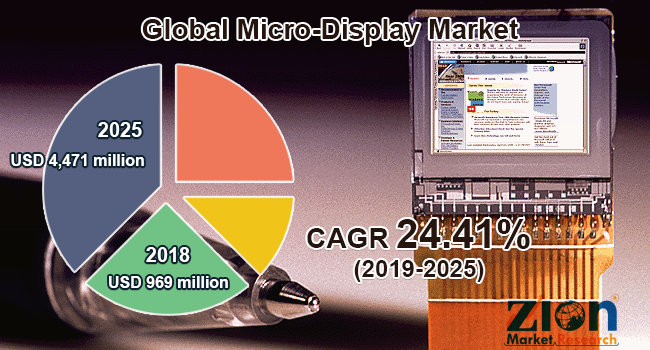 According to the report, the global micro-display market was valued at USD 969 million in 2018 and is expected to reach approximately USD 4,471 million by 2025, at a CAGR of 24.41% between 2019 and 2025. A micro-miniaturized electronic display with an extremely small-sized screen is defined as a micro-display. The display screen size of any micro-display is usually less than a quarter inch diagonally. These compact displays are designed with user-configurable technology and facilitate high resolution required for developing quality images. The global micro-display market is likely to grow over the estimated timeframe owing to the flourishing consumer electronics industry. Due to high resolution and low-power consumption, micro-displays are extensively used in numerous consumer electronics applications. Thus, to show different readings, micro-displays are integrated in various consumer electronics devices, such as mobiles, smartwatches, and fitness bands, among various other wearable electronics devices. Consumer electronic market is forecast to account over USD 331,405 million by 2019 and. However, the high cost and heat loss may hinder the micro-display market to some extent in the future. Moreover, the worldwide research and development activities initiated for OLED micro-display manufacturing are expected to open new growth avenues for this market in the upcoming years. The global micro-display market is segmented based on product, display technology, application, and vertical. By product, the market is classified into projection and near-to-eye displays (NEDs). The projection segment is slated to dominate the market in the future. By display technology, the market includes liquid crystal on-silicon (LCoS), liquid crystal displays (LCD), digital micro-mirror display technology (DMD), digital light processing (DLP), an organic light emitting diode (OLED), and others. The OLED segment is estimated to grow rapidly over the forecast time period, due to the increasing R&D activities and commercialization of OLED micro-displays. By application, the market includes a head mounted display (HMD), head-up display (HUD), an electronic view finder (EVF), and projector. The head mounted display (HMD) and head-up display (HUD) segments are expected to register the highest CAGR in the future. By vertical, the market is categorized into automotive, aerospace and defense, retail, healthcare, entertainment, and others. North America is likely to hold a substantial market share in the future, owing to the increasing demand for projectors with micro-displays for the educational sector. The Asia Pacific micro-display market is projected to grow rapidly in the upcoming years, owing to increasing adoption of wearable electronic devices, such as smartwatches and fitness bands in developing Asian economies, such as India and China. Some key players of the global micro-display market are KopIn Corporation Inc., Sony Corporation, Micron Technology Inc., Universal Display Corporation, eMagin Corporation, LG Display Co. Ltd., Raystar Optronics, OLiGHTEK, Himax Technologies, WINSTAR Display, Seiko Epson, Microvision Inc., HOLOEYE Photonics, Syndiant Inc., and AU Optronics Corp., among others.